How to Create a Stunning Infographic Resume? Do you want to draw the attention of employers to your candidacy even before the interview stage? Try adding graphic elements. 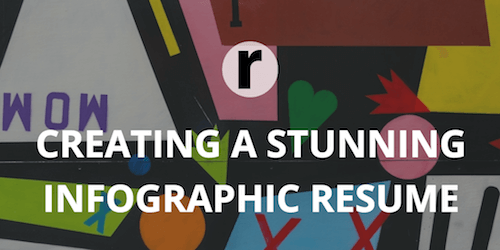 It's easy to predict the reaction of readers to this article: "an infographic resume isn't that serious," "this trend is popular only for creative professions." However, don't make hasty conclusions. Resumance offers to understand what opportunities the graphic resume has, who should present themselves in such a way, and who does not. According to HR managers, only a few applicants use graphic elements in the design of their professional business cards. Basically, these are people of creative professions, for example, designers, artists, architects, copywriters, PR-managers. For them, this style is quite acceptable. On the contrary, the resume of an economist, engineer, accountant should be conservative, informative and accurate, there is no place for creativity. How to make an infographic resume? First, analyze whether you need a graphic summary. Will this be appropriate for the position you are applying for? If the answer is yes, then proceed with the selection of the abstracts that will be included in the infographic. Take as a basis the text of your resume. At the same time, re-read it, update the information or delete unnecessary data. The graphic resume should include text blocks: name, surname, contact information, education data, previous jobs, projects, personal qualities of the applicant. Formulate the sentence succinctly and read 4 most important things your document should have. Make a sketch. Sketch out what the infographics will look like. Structure the information, all the most important place in the center, and additional data on the sides or below. Don't forget to insert a photo. If you are proficient in graphic editors, it's not difficult for you to make an infographic resume yourself. If not - use the special tools on the Internet. You can find such at our list of top resume makers. Most of them are free. Don't overload your resume with a large number of graphic elements. Everything in moderation, including moderation. Don't use too bright colors. Present data on experience, implemented projects, attracted clients in numbers and facts. An infographic resume is a great way to show that you are an extraordinary person, ready to provide the company with interesting ideas. But it has both advantages and disadvantages. If you decide to make a CV using infographics to ensure that the recruiter or potential employer is guaranteed to pay attention to you, Resumance advises you to make two copies. The first one is standard, and the second one is infographic. Also, do not forget to attach a cover letter to your resume.